Looking for a good juice recipe to welcome your guests? Then definitely you should try this ginger lemonade juice. 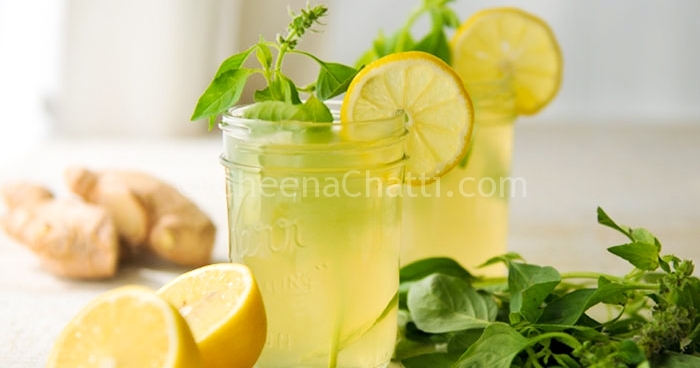 This is an easy to prepare recipe for ginger lemonade. I got this recipe from my brother who is in North India. He learned it from a local shop there. This is a refreshing, fat-free drink perfect for springtime bridal showers or hot summer days on the deck. Chill out with this delightful cooler. Crush the ginger and extract the juice. Add 1cup of water to this and keep it overnight. Dissolve the sugar in water until it reaches saturation and keep it aside. Next day drain the clear liquids from the ginger solution and mix with the lemon extract and the sugar syrup. Warm this solution and allow it to cool. You can preserve the solution for later use in refrigerator. To serve : Add 1 glass water for 1/4th glass of the juice. Serve chilled with ice cubes. Garnish it with mint leaves and lemon slices. We have other lemon recipes also. Try them. This entry was added on April 25th, 2013 by Renoos in Desserts and tagged with kerala ginger lemon juice, dessert, ginger lemonade recipe, easy lemon juice, lemon, how to make lemon juice, kulukki sarbath, how to make lemonade, lime juice. Last revised on April 4th, 2018.